Forget Waldo, leave a comment to guess where Porky was when he took the below picture. Hint: it’s a tiny barbecue joint named after a tiny town (hamlet?) down east. 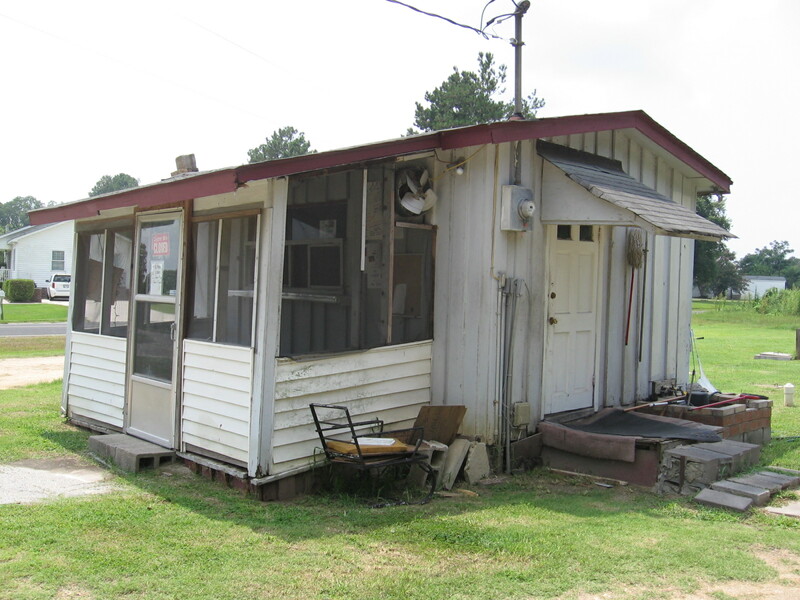 A true barbecue shack if there ever was one. Dude, that is Jason Grill and BBQ in La Grange. Been there. You are correct! Sadly, it was closed when I visited. What was your verdict? Worth me driving 2 hours to visit? It’s very good- the slaw in particular is one of the best I’ve had. But the hours are erratic, there’s no phone, and it’s in the middle of nowhere, which makes it problematic. For anyone planning to go, I’d recommend having Grady’s in mind as a backup plan. Grady’s was — IMHO — much better. But Jason was good, just not spectacular. It is worth a visit, but (again, IMHO) I wouldn’t make the 2 hour drive again — if I were investing that kind of time I would go to Grady’s. I did get a tour of the pit, which was pretty cool. And I gave the proprietor a ride up the street to get some cigarettes.